Rhett Schwichtenberg is an Associate Attorney building his practice on advising a variety of agribusinesses, growing and emerging companies of all sizes. He is dedicated in representing the best interests of his clients through the foundation to the succession plan and all aspects in between including financing projects, corporate agreements, mergers and acquisition transactions, general matters, estate planning, wills and trusts. 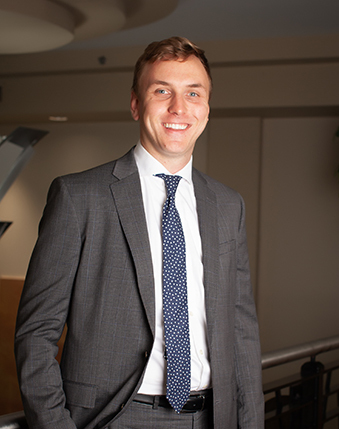 Rhett is a graduate of the University of Minnesota Law School, Juris Doctor with a Business Law Concentration primarily focused in tax law, and a graduate of Gustavus Adolphus College with a Bachelor of Arts in Public Accounting. Rhett enjoys mountain biking, rock climbing and music production, along with working with his parents’ vineyard located in Waterville, Minnesota.